Yves Zermeño is Freed Omegadrone and a current Agent of AEGIS. Operating under the heroic code name of Argonaut, Yves seeks to prevent tragedy from hitting her current home as occurred in her past. In another world in which the mythical First Age never came to a close, the Lor Republic stretched to every corner of explored space. The military existed primarily for the purpose of exploration and further colonization of Lor Space. Quality of Life for citizens of the advanced civilization was such that only a sci fi novel could compare. Yvejskrujanharbh'aar was a freshly graduated university student with a future as a star faring diplomat in all but certain. Her life was pretty much uneventful. She had friends, family, loved ones and her personal tragedies were no more exciting than a lost pet here or there. Having never left her home planet, her dream was to engage in interplanetary relations perhaps to eventually take a seat as a Senator. The Lor citizens born on the planet of Lor-Zul are known for being born with two very distinct features. The first being a long life span in which they maintain a youthful appearance, only showing signs of aging during the last quarter of their lives. The second a natural affinity with languages their mind able to comprehend all spoken and written word as if they were living ciphers due to a unique psionic mutation. It was only the first trait that appealed to Shadivian Steelgrave after the Terminus came. With no enemies to oppose the Lor the military was nowhere near qualified to handle the unified front of the combat drones that swept their world. The Lor were crushed and in the end there was only the Terminus. Life as a conquered slave with the Hundred Worlds was far different for the Lor. Gone from Spacemen to cavemen one had to let a piece of himself die just to survive. In Nihilor only the strong survive. And what she lacked in physical might, Yvejskrujanharbh'aar made up for with sheer willpower and luck. Engaging in brutal gladiatorial fights until she scrapped by on top of her opposition. Her prize? Her mind was torn asunder as she underwent the unspeakable acts that defined the Omegadrone conditioning. Brainwashed by the Omegadrone conditioning Yvejskrujanharbh'aar had long faded she was merely a servant of Omega. Serving on the front lines as an Omegadrone Shocktrooper. Many people remember the Terminus Invasion of 1993 differently. Most of those memories are not looked back on too fondly. But for Yvejskrujanharbh'aar it was her first real memory since her first shot at life had ended. As one of those very invaders, she found herself barely clinging to life by the time the battle had come to a close. Her armor was skewered onto a steel rod at her abdomen. Recovered by AEGIS field agents, she was given medical treatment as the organization wasn't out to just let people die. Even those part of a foreign invasion force. Of course if it brought about the opportunity to learn more about the Terminus forces more power to them. It took a think tank of the top AEGIS psychologists and doctors to match Daedalus efforts in deprogramming the Omegadrone conditioning. They even crafted a new identity for her to live, monitored by a field agent, just outside of their Baltimore offices. Yvejskrujanharbh'aar or Yves as she had now come to be known just had to agree to surrender her armor to them as well as acting as a consultant whenever the need struck the agency. When Dr. Doris Volk joined AEGIS in 1997 amongst the many projects she pursued was the development of MAX series Power Armors. Shorty after completing the designs on the Super-Max armor Dr. Volk had already begun considering the process for advancing upon her design. Searching through old AEGIS files for inspiration Dr. Volk eventually came to learn about the deal AEGIS made with Yves. It took a decade to combine the technology of the Omegadrone with that of a SUPER MAX armor creating the first flight capable power armor, far before the distinctly more well known models used by Subjects V and V2. The most problematic bit of integration was that the armor's neural interface would only respond to omegadrones like the armor's previous pilot, Yves. A neural interface was originally designed to reinforce the Omegadrone conditioning and improve Nihilor's Mixed Murder Arts by recording combat data and aiding the pilot adapt in all situations. Dr. Volk's attempts of repurposing the interface to aid field agents in saving lives could not completely overcome the fact that only a mind whom had gone through Steelgrave's brainwashing was the only one capable of conceptualizing such an idea. So she requested Yves assistance in improving the combat data of the interface as Dr. Volk attempted to overcome the flaw in the design. An offer that went through a very long series of refusals before Yves finally relented with some trepidation. Spending weekends as a test pilot for the tongue in cheekily named MEGA-MAX armor. Breaking away from the training simulation when the armor caught the transmission of a nearby alarm system in which a shoe store was being robbed by three heavily armed men. 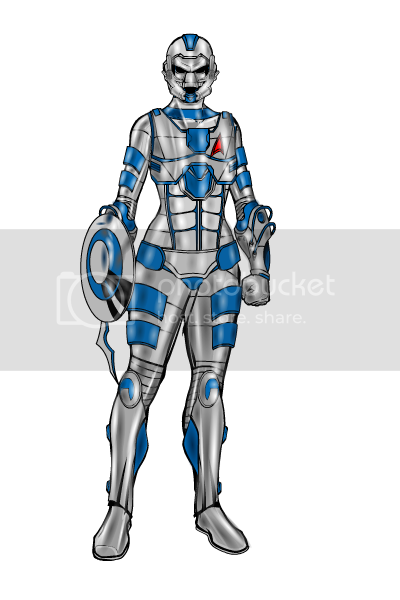 Within the comfort of her armor she was able to easily able to deal with the crooks. Disappearing before AEGIS latest line in experimental technology could be shaken. Upon her return she wasn't admonished for taking off with government property as she expected. Instead there was a congratulatory fanfare and applause and she was offered a real job with the agency. After weighing her options and the sense of satisfaction that came with actually doing something good with the armor she took the job. In her personal life, Yves and her handler had wed some years back. Together they were raising three girls from his first marriage. Although at this point the eldest was studying at FCU, so the children did not exactly outnumber the parents in the household. Eventually the Zermeños requested a change in duty station from Baltimore to Freedom City. Marking her return to the city after 20 years as the armored hero Argonaut. Aside from being in very good physical , Yves body has been cybernetically modified as part of the Omegadrone process. These modifications have made her both stronger and more physically conditioned than befitting a woman of her size. As a Lor Mentat Yves was psionically attuned with an innate understanding of all spoken language. Extended time in Nihilor and traversing the Cosmic Coil for invasions have left the freed Omegadrone immune from any tampering to the temporal stream. Caradoc/Harrier: Steven Murdock, fellow freed Omegadrone whom Argonaut encountered while on a mission to Australia. Dr. Volk: Scientist in charge of AEGIS MAX armor series. Carlos Zermeño: Husband, former member of Team Alphabet. A trained mercenary with a bionic of arm. The pair have three children together as a result of Carlos' prior marriage. Argonaut uses a rebuilt Omegadrone armor using an alloy made out of spare parts from broken MAX Armors and Omegadrone armors. The armor itself contains tiny nanofibers that are far stronger than human muscle fibers of equal size. The tiny nano muscles allow her to perform feats of strength above what is humanly possible. The armor's boots are able to act as a propulsion system for flight. Chanellig the entropic energies of the Terminus for a perpetual source of energy. When not in use the Omegadrone armor is stored as a portable briefcase. As impressive as the armor itself is. The signature weapon of the megadrone is not without mention. Cold Terminus Steel capable of acting as a conduit to the Terminus, the power pike can fire bolts of entropic energy. Or more. The power pike is also able to blend in with the user's surroundings. Camouflaging the user before a deadly strike. The fact that the foot soldiers of Omega are nothing more than bodies to be thrown at a problem means that this feature had little use for anything other than the opening of a drone invasion. Dr. Volk is supposedly researching the means to combine the cold dark metals of the Terminus with Impervium creating the alloy for a unique living metal armor. Rather than putting AEGIS agents through cyberization the MEGA-MAX series of armors is purported to use a neural interface much like Argonaut's shocktrooper armor. Mimicking the behavior seen by the Communion the armor allows a symbiotic bond of man and armor. Adapting the neural technology and finding a power source are the supposed last hurdles in unveiling the new line of MEGA-MAX armors. The Edge of the World: Argonaut and Cavalier find remnants of the Terminus having slipped into Earth's biosphere. Trudging up old traumas the pair hastily escape a ship housing a psionic monstrosity of Dr. Friendly's leftover experimentations. No More Good Days: Argonaut was sent on assignment to Australia in the hopes of retrieving a Terminus artifact. She found herself teaming with Harrier, and Vector when caught in the middle of the Omega Boss' plans to level Australia with a series of Terminus bombs. Vector was badly injured in the confrontation and a local hero was killed before the day was ultimately saved. Heavy Decisions: Argonaut, Kit, Nevermore, and Terrifica all find themselves wrapped up trying to catch a thief with stolen technology. Only they quickly find out they're not the only ones after the thief. A Matter of Recognition: Steve introduced Yves to Erin White, a fellow survivor, over an awkward dinner. In which Vector presented both Steve and Yves medals. In honor of their efforts in Australia much to their chagrin. All in Hand: Argonaut and Stronghold find themselves teaming up to prevent a traitorous AEGIS Agent seeking to steal various artifacts from AEGIS' vaults. Badly Soiled: Argonaut is sent to backwoods Alabama to deal with Black Knight who was causing a scene. Apparently, attacking mutant mushrooms. Despite a tumultuous meeting the pair worked with local pd to get to the bottom of things. Ah say they worked together. Shanghai Surprise: Argonaut, Terrifica, and Titan found themselves traveling to China in search of stolen artifacts. Placed in the black market by Agent Hand. Incursion: Red Five: The Communion had been content to use its world killer as a feint to distract most of the Freedom League near Pluto's orbit but with the true attack on Earth pushed back, five heroes volunteered on a suicide mission. Aiming to destroy the superweapon before their home joined Lor-Van!